Orto means garden in Italian, and it is the picturesque 16th-century inner garden with its original frescos that brings the 4-star Hotel Orto de' Medici much of its charm. The hotel is situated in a quiet location, a short walk from the Uffizi, the Duomo, and the Academy of Fine Arts where you’ll find Michelangelo’s David. Rooms are decorated in the warm Florentine style and come with LCD TVs and free wi-fi. For authentic Italian cuisine there are a number of excellent restaurants nearby. 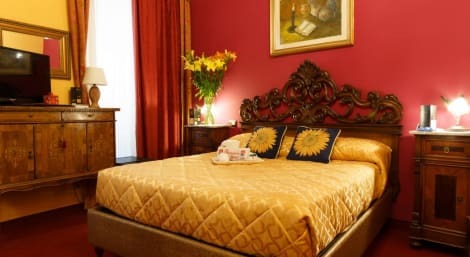 Set in a neo-classical palace, the 4-star Room Mate Luca Hotel is steps from Florence’s famous Piazza San Marco and surrounded by some of the city’s best cultural destinations, restaurants and bars. This trendy hotel is the ideal base from which to explore Florence. A TripAdvisor Certificate of Excellence winner, there’s a complimentary breakfast buffet and free wi-fi throughout. All rooms are modern and cosy, the perfect place to relax, with air conditioning and flatscreen LCD satellite TV. Offering a sun terrace and spa centre, Italhotels Ginori Garden Deluxe is located 700 metres from Santa Maria Novella Train Station in Florence. Free WiFi access is available throughout. Air-conditioned rooms all have a satellite TV, an electric kettle and minibar. The private bathroom includes a hairdryer and free toiletries. At Italhotels Ginori Garden Deluxe you will find free bikes, a shared lounge and garden. The guest house a 5-minute walk from Florence Cathedral. The Ponte Vecchio Bridge can be reached on foot in 10 minutes. Florence Historic Centre is a great choice for travellers interested in Seafood, Wellness and Healthy Food. Garage cost is 40.00 € per day.The price of the pool is € 15 per person per day for all rooms except for the Deluxe where it is included in the room rate. ***The pool is open from May till September***. 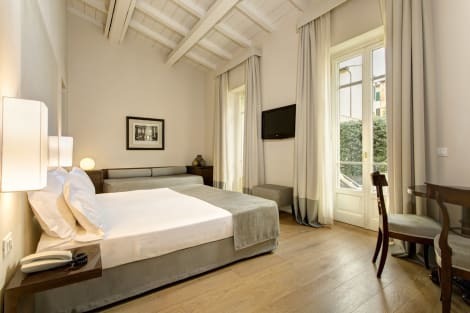 The 4-star Hotel Ginori Al Duomo Firenze is found in an ideal location in the centre of Florence. Close by discover the Hospital of Innocents, San Marco Museum, the River Arno, The Baptistery of St John and Florence Cathedral. Free wi-fi is available throughout and a buffet breakfast is served daily in the breakfast room. Every room is air-conditioned and has a minibar, radio, tea/coffee making facilities, double-glazed windows and a flatscreen LCD TV. Garage cost is 40.00 € per day .The price of the pool is € 15 per person per day for all rooms except for Deluxe room where it is included in the room rate. ***The pool is open from May till September***. Breakfast cost is 10 euro per person per day. Featured amenities include dry cleaning/laundry services, a 24-hour front desk, and luggage storage. A train station pick-up service is available for a surcharge. Grab a bite from the snack bar/deli, or stay in and take advantage of the hotel's room service (during limited hours). Wrap up your day with a drink at the bar/lounge. Buffet breakfasts are available daily from 7 AM to 10:30 AM for a fee.